Are you looking for a fun, engaging activity for the first day of school? Your computer science or math class will be the talk of the school when you get the kids up out of their seats! Students start by encoding their name with the cipher. You collect the slips once the front side is completed. 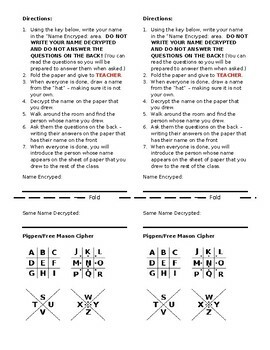 Once you have them all, have students draw a random slip and decode the name. Students will then find that student and, using the interview questions, write down their responses to the question. Once everyone is done, pick a student to introduce their person. That person will then introduce theirs, repeating until everyone has been introduced. Feel free to edit the interview questions to meet your classroom needs!